Anxiety. It's real. It can be debilitating. How can we deal with it? How can we help our kids deal? Research tells us that gifted kids and adults are no more likely to struggle with these difficulties than other kids and adults. Some suggest that giftedness protects from Anxiety, while others suggest that it can create excess anxiety. What are the symptoms and side-effects of gifted anxiety in your life? Don't miss our previous Blog Hops, Gifted Self-Care and The "G" Word . If you'd like to join our next Blog Hop, visit Gifted Blog Hops. Special thanks to Pamela S. Ryan for our Blog Hop graphics! 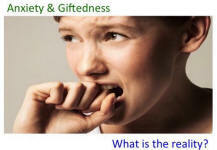 But are gifted people really perfectionists? Are they really more likely to be perfectionistic than anyone else? And are we confusing perfectionism with a healthy drive to excel? Do you know what I wouldn’t want to do to him, folks? I wouldn’t want to place him in a classroom Monday-Friday for an entire year where the teacher would be going over material that he had mastered in preschool. Yes, he already had a difficult time sitting still and focusing, but how on Earth would putting him in that classroom situation help with those issues? It’s coming. It’s coming again. And then you feel the familiar terror that turns your mouth to dry cotton, makes your stomach do somersaults, and heightens every sense. Your hands go clammy. Your scalp gets prickly. You can just feel eyes on you!